Tommy Cannon Studios: Check out Fred the Mustard Packet on WEBTOONS! 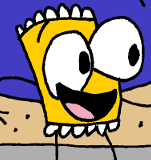 Check out Fred the Mustard Packet on WEBTOONS! Webtoons is an exciting platform for webcomics. Subscribe to Fred for free there and never miss a page! Click the above link to see the latest Fred material. Get your lunch buddies to subscribe too. There's no other comic like it on Earth! Take in, Earth! Take it in. Who wants a Fred the Mustard Packet button? Monsters need Doctor visits too!